OXFORD, England (CNS) — A Belgian bishop said the president of the bishops’ conference urged Catholics to respect a court judgment against him for failing to act on allegations of abuse. However, Auxiliary Bishop Jean Kockerols of Mechelen-Brussels also said the ruling provoked concern that it could spur more claims for damages, and he said it would take a while for the church to regain credibility. “Our church set up a special commission to investigate such cases, which will soon complete its work,” Bishop Kockerols told Catholic News Service, adding that he believed the Belgian church’s procedures for combating abuse were now robust. “After the damage we’ve suffered from these cases, it’ll take us 10-20 years to regain our credibility as a church. What’s important in the meantime is that we’re not intimidated into silence. When you’re walking a tightrope, your best chance of finding a balance is to keep moving forward,” he said. 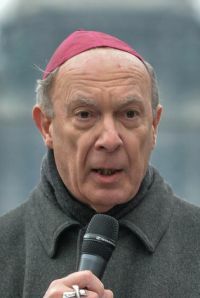 The Appeal Court in Liege ruled against Archbishop Andre Leonard of Mechelen-Brussels, conference president, in a case dating to when he was bishop of Namur, 1991-2010. The court said the archbishop was guilty of misconduct and ordered him to pay $11,000 to a former Catholic seminarian, Joel Devillet, who was sexually abused as a choirboy in Aubange by a Catholic abbot, Father Gilbert Hubermont. Devillet, now 42, took his case to the Appeal Court after a previous damages claim against the archbishop was rejected by a Namur court in 2013. Belgium’s Catholic Church has been dogged by abuse allegations since 2010, alongside parallel claims against the clergy in other European countries. In a 2010 pastoral letter, the bishops’ conference asked forgiveness from victims, after Bishop Roger Vangheluwe of Bruges resigned following an admission he had molested his nephew. Meanwhile, Philippe Malherbe, lawyer for Archbishop Leonard, said April 27 he believed the case against his client was “juridically fragile,” adding that an appeal was being considered. On May 6, Archbishop Leonard turns 75 and, under canon law, must offer his resignation to Pope Francis. The case against Archbishop Leonard follows the April 21 resignation of Bishop Robert W. Finn of Kansas City-St. Joseph, Missouri, following a court ruling that he failed to report suspected child abuse.